Those of you who are paying attention already know this, but we’re big fans of Bluetooth helmet communicators here at MO. (BT communication won our 2014 MOBO award for Best Technology). Well, everyone except Burns, who prefers belting out his own soundtrack inside his helmet while he rides. (In case you’re wondering, the quality is way better than your neighbor who sings in the shower at inopportune times. We know because we sometimes force JB to wear a communicator on long rides which comes in handy when there’s no cellular data connection to pull in Pandora.) You’ve also probably noticed that we make lots of on-bike videos to go along with our road tests. Well, Sena found a way to combine the two activities into one award-winning product, the Sena 10C. If you ever had the inkling to get a communicator, but weren’t sure you wanted to take the plunge on an action camera, or if you wanted an action camera but really don’t want people to be able to reach you when you’re riding, the Sena 10C may push you past the tipping point through its combination of a reasonable price and tremendous utility. The Sena 10C does everything you need from a Bluetooth device: interfacing to your smartphone for music, getting turn-by-turn directions, or making calls. Those who have a regular gang to ride with will like how the 10C connects with up to three other Sena Bluetooth headsets. Pairing to one non-Sena headset via Universal Pairing brings the total to four. Or you could just listen to built-in FM radio. The speakers offer good audio for most riding situations, and the noise-canceling microphone can surprise many people when you tell them that you’re traveling 80 mph – on a motorcycle – as you talk to them. And then there’s the built-in camera. Because the camera is contained within the communicator, you can have any audio that the communicator receives included in the video if you choose. This makes voice overs for vlogs completely painless. Since the camera and communicator share the same battery, the 10C recognizes low power situations and shuts down the camera while leaving two hours of communication time in the battery to get you home from your ride. Camera time is approximately 2.5 hours while talk time, when used separately, can be up to a claimed 17 hours. 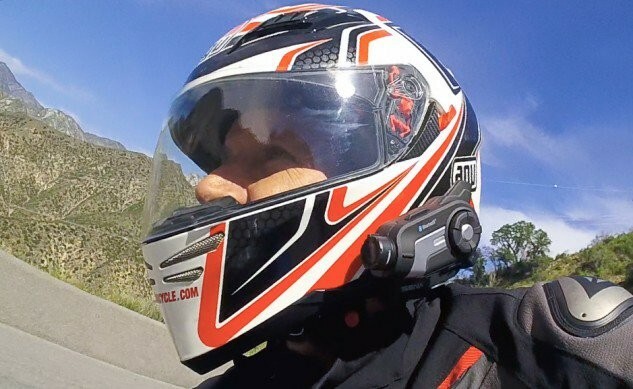 While Bluetooth helmet communicators and separate action cameras have been around for a while, the Sena 10C is the first to combine them, significantly lowering the cost of entry for the pair. Additionally, this system is one that provides value to all riders and doesn’t limit its utility to only one category of enthusiasts. Consequently, the $349 Sena 10C is our choice for Best Motorcycle Product Of 2015. If you were using the internet during the time that we held our video conference to finalize out MOBO selections, you may have noticed the data slowdown, as our debate over the Product of the Year raged, consuming much of the bandwidth on the continent. In the end, the Sena 10C won because it could be utilized by all motorcyclists. 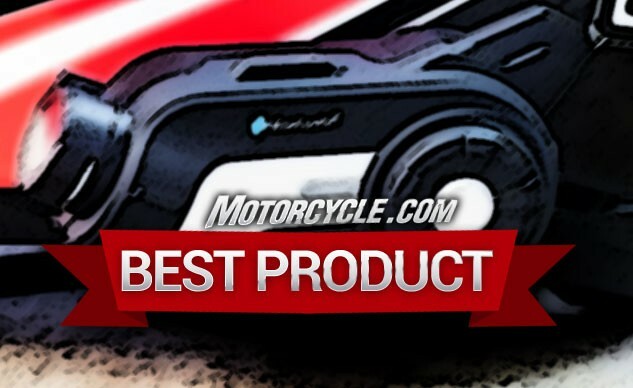 The HealTech Quick Shifter Easy became the Honorable Mention because it mostly applies to sporting motorcycles. Still, that doesn’t change the fact that the QSE is a remarkable product that brings quick-shifter technology to motorcycles that don’t have it available as a factory option. Most importantly, the constantly growing list of model applications includes bikes dating back as far as 1989! Yep, you read that right, 1989. What makes it possible is the nifty strain gauge that is small enough and so sensitive that it can be mounted in several places. No bulky replacement shift rod required. The strain gauge attaches to a Bluetooth control module which, in turn, hooks to a model-specific wiring harness adapter. While the baseline settings may be enough, the module’s Bluetooth connection to your Android phone (iOS is on its way) allows the user to fine tune the strain gauge’s sensitivity (a must for bikes that pull the shift rod instead of pushing it). Additionally, the duration of ignition/fuel injection cutout can be altered to suit your bike’s characteristics. This can make the QSE work much more reliably at lower rpm. The QSE’s firmware can also be updated via Bluetooth, making sure that the system always has the latest version available. 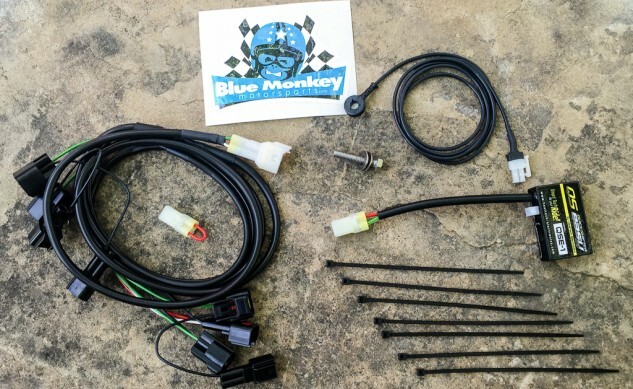 If you’ve wanted to experience the joy of full-throttle upshifts on your older sportbike, contact the HealTech Quick Shifter Easy’s U.S. distributor, Blue Monkey Motorsports, to see if your bike is supported. You can order yours for $290 directly from Blue Monkey. This combination of a wide range of applications, adjustability, upgradability, and ease of installation makes the HealTech Quick Shifter Easy the MO Honorable Mention Best Motorcycle Product Of 2015.